Travel is a contradictory process. You leave your country because you want to see things in other countries. But you want to see them as they would be if travellers hadn't visited. Which unless you are a Great Adventurer (which I'm not) is a problem. Another problem is that often the easiest way to find out what there is to see is to read guide books, which by their very nature point you in the direction of what everyone else is going to. Still, sometimes you do something that is the perfect balance between "packaged for the tourist" and "hardly anyone knows about it yet". Our Ayeyarwady Delta boat trip was such a thing. As I mentioned in my blog about Pathein, the area is relatively tourist free. 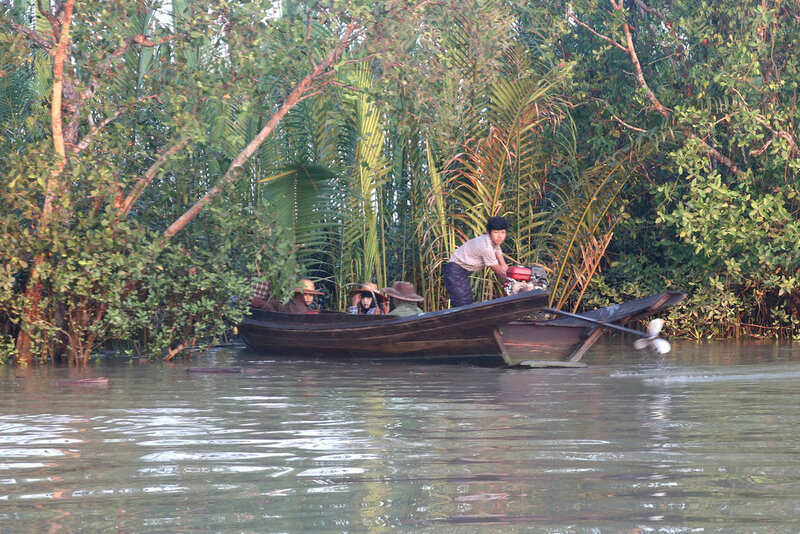 But a search for "things to do in the Ayeyarwady Delta" revealed a Myanmar Times travel article, and contact details for John, billed as "a friendly, well-fed man with chubby cheeks and a gentle demeanour". 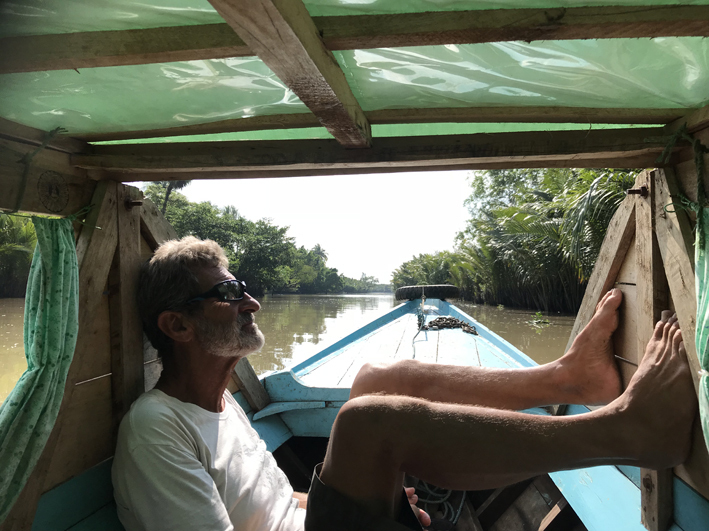 John, the article said, had for the last few years (since it stopped being a crime to fraternise with foreigners) supplemented his income as an English teacher by running Ayeyarwady boat trips. So I left a message for John and he appeared at the hotel on his motorbike to tell us about the tour, which was ridiculously cheap ($60 for a boat and a guide for the whole day), exclusive (no other tourists), and included all sorts of excitements as well as the boat trip itself - exploring villages, walking a bamboo bridge, visiting a noodle factory, and lunch. And it turned out to be all that was promised, and more. John is an excellent tour guide with very good English, the places we went were interesting and unspoilt by tourism, and the people we met almost embarrassingly friendly and welcoming. All in all, we had a lovely day, with that additional smug-at-doing-something-so-fun-that-isn't-in-the-Lonely-Planet bonus. - When we had asked what time we would leave, John had suggested 8am, but wasn't fazed when we wondered if it would be nice to see dawn over the river. (It's quite hot during the day in the delta region, even in winter, and the light's always better in the early morning.) So he and his friend arrived at the hotel on motorbikes at 5.30am, Geoff and I hopped on the back, and off we went in the dark. A bit chilly at that time of the day, but worth it when half an hour later it started getting light and the mist over the paddy fields was gorgeous. As was the sunrise over the river. - For a while we pottered along little channels, with the odd house on the bank, and a few other boats. 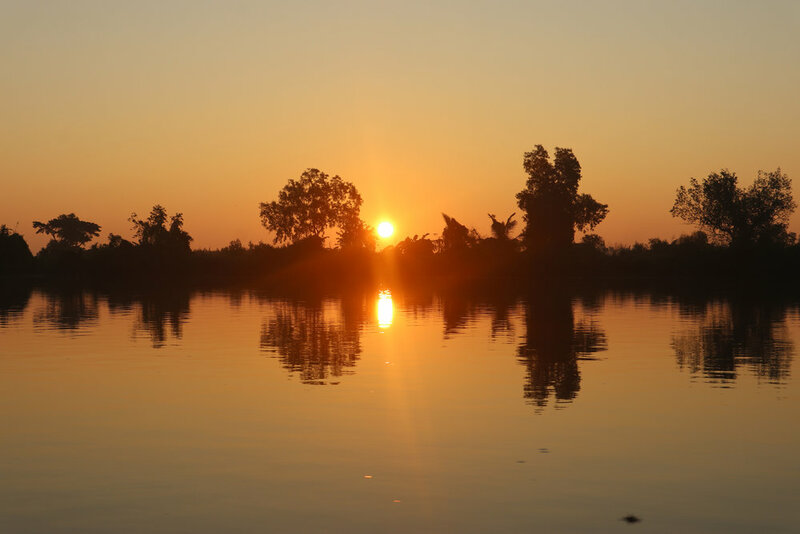 We'd expected fishermen, but apparently farming is more lucrative in the fertile delta region, so guys only fish when the mother-in-law says she needs something for dinner. - Then we called in at a couple of small villages - each with a 200-300 houses, a pagoda or two, a school and some small shops and food stalls. - Then, in the first village, we came across a wedding - a random stroke of luck for us. You can tell there's a wedding going on because of the MUSIC, which blares out at FULL VOLUME from speakers hired by (in this case) the groom's parents. You don't need an invite for a rural wedding in Myanmar; when they hear the music, everyone in the village puts on their best longyi and heads off. The event was modest, a widow marrying off her youngest son, but the little wooden house was decorated with offerings of bananas, coconut and pickled tea leaves for the spirits (called nats), and there was a screened-off bridal suite prepared for the couple's first night. There was also an awning outside with tables and chairs for guests. 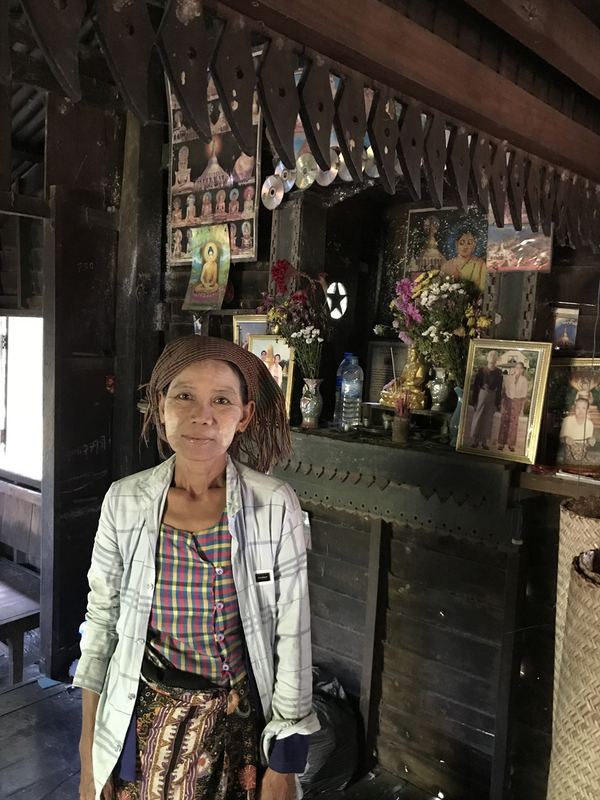 From what I can gather, all that's needed in traditional Myanmar society to make a wedding legal is for a husband and wife to let people from seven houses on either side of their house know about their decision (although I think these days you also have to sign a marriage certificate in front of a judge). But a wedding is always a good excuse for a shindig. The newly-married couple sat in the entrance way wearing their best longyis and greeting guests, pressing cigarettes and sweets into their hands. 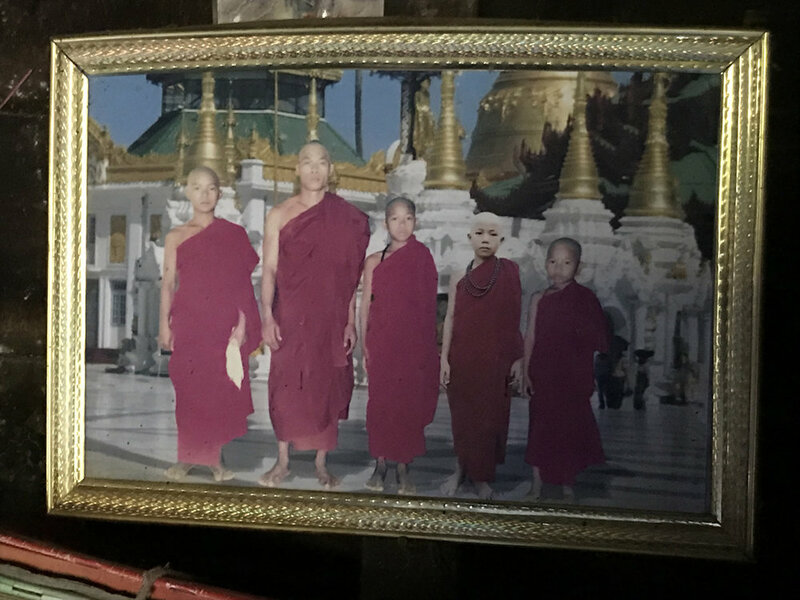 - Other highlights included having a cup of tea with a couple of lovely village women, who proudly showed off their grandchildren, and their family photos, mostly of husbands and sons doing their stint as a monk. It seems that sometimes a boy will do his time as a novice at the same as dad enrols as a full-blown monk. Mum can then make sure both get something decent to eat by delivering rice and curry into their alms bowl in the morning. This lovely woman didn't seem to mind the guide bringing random foreigners in for a cup of tea. Is this not a Most Fine Hat, from a Most Fine village store? * “As I see the world, there's one element that's even more corrosive than missionaries: tourists. It's not that I feel above them in any way, but that the very places they patronise are destroyed by their affection.” Tahir Shah, travel writer, fromHouse of the Tiger King: The Quest for a Lost City.